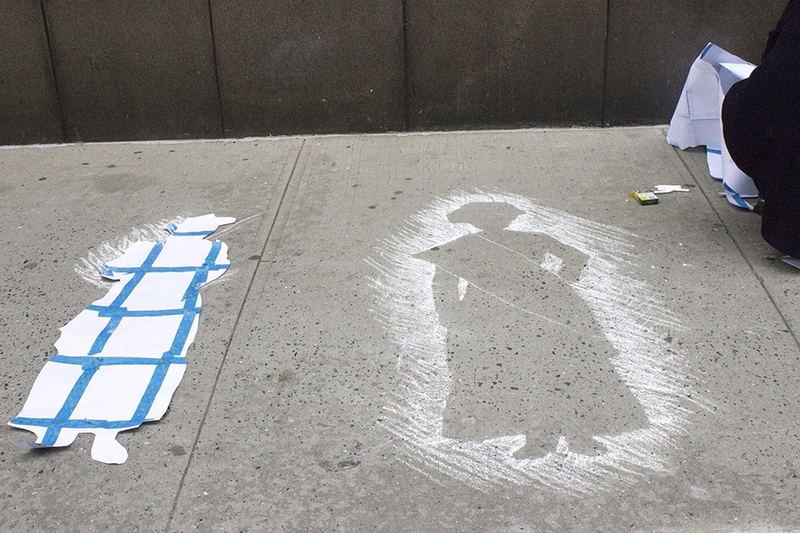 Eight chalk silhouettes cover the sidewalk at the corner of Greene Street and Washington Place. 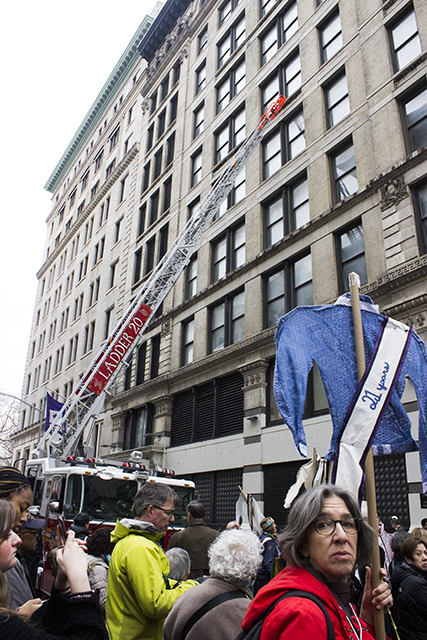 Earlier today, union members, activists, city officials and others gathered outside the landmarked site of the Triangle Shirtwaist Factory to honor the 108th anniversary of the historic blaze that revealed abhorrent working conditions but ultimately strengthened the labor movement. Dozens of labor unions– representing firefighters, actors, teachers, postal workers, and more– turned out to commemorate the 1911 fire, which killed 146, and celebrate labor wins since then. The speakers saluted wins for domestic workers’ rights and bills for paid vacation time, but also acknowledged the specific challenges faced by female and immigrant workers. 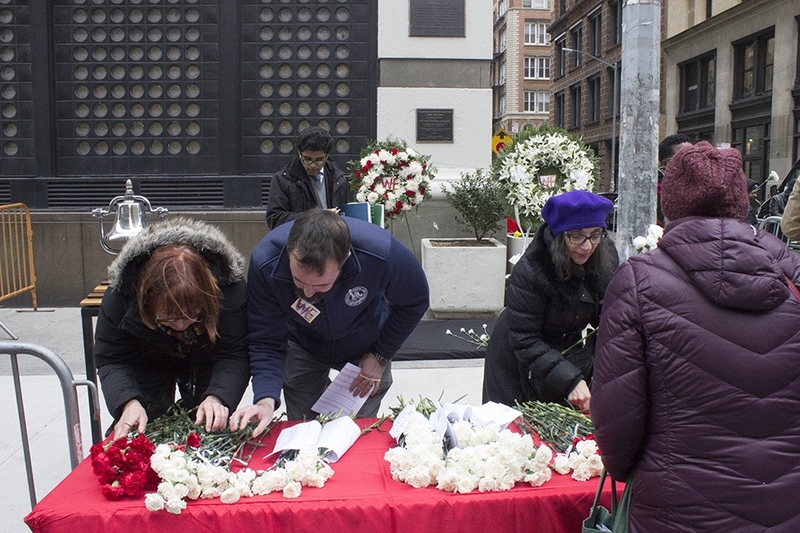 Perhaps because of the current political climate, this year’s commemoration paid special attention to the layered identities of those killed in the fire: workers, women, and immigrants. Three invocations– from Jewish, Muslim, and Christian spiritual leaders– opened the commemoration. Each of the speakers emphasized the need to celebrate diversity, religious and racial, at the event itself and in American politics more generally. Likewise, New York State Commissioner of Labor Roberta Reardon lauded the role of women in organizing for labor rights after the fire. She emphasized the work of Frances Perkins, who became the New York State Commissioner of Labor in 1929 and then the U.S. Secretary of Labor in 1933, making her the first female member of the federal cabinet. Members of the gathered crowd held signs announcing their membership in labor unions or acknowledging the victims of the fire. 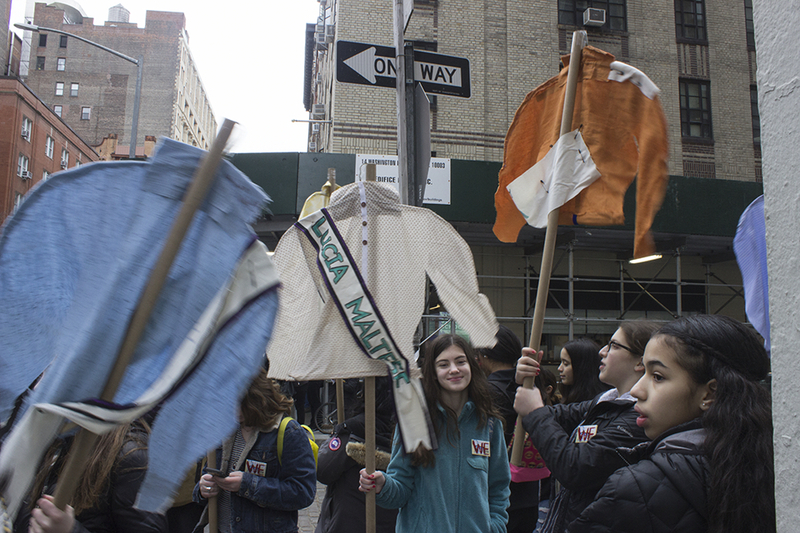 More than a dozen people held signs made to look like a woman’s shirt, with a sash listing the name and age of a young woman who died in the fire. And, on the cement sidewalk below the windows of 23-29 Washington Place, the chalk silhouettes honored the mostly immigrant women who organized for workers’ rights during the era of the fire. Chalk artist A.c. Harkness said that the silhouettes represent women who marched in the Uprising of the 20,000, a labor strike by mostly Jewish women that occurred in 1909. On her Instagram, Harkness explained that each of the women depicted holds a sign reading “I have something to say,” in Spanish, Arabic, French, English, Italian, Russian, Chinese, and Bengali. 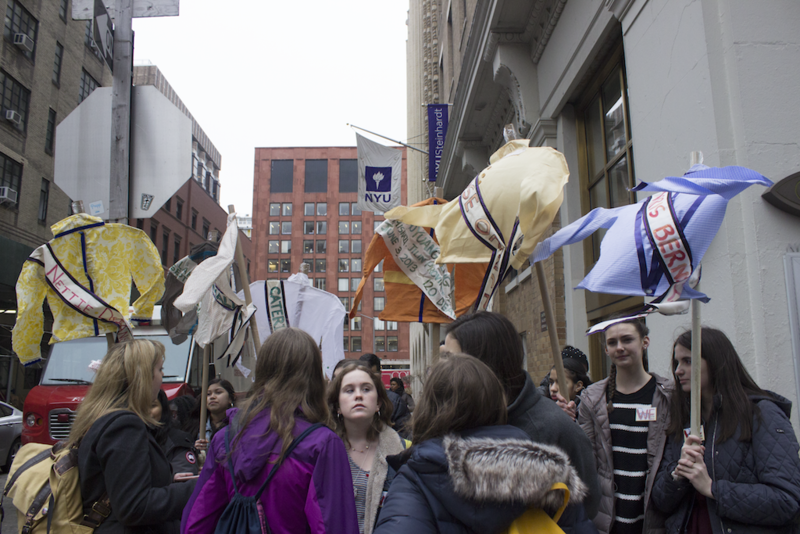 Above the silhouettes, on the actual facade of the Triangle Shirtwaist Factory building, activists and union organizers hope that a permanent memorial will commemorate the fire by next year. The nonprofit Remember the Triangle Fire Coalition has coordinated with artists Uri Wegman and Richard Joon Yoo to design a public memorial which will list the names of the 146 victims. The State of New York has already offered $1.5 million to fund the construction of the memorial, but the coalition is also raising funds for an endowment to sustain maintenance of the memorial. During her address, Labor Commissioner Reardon remarked that next year’s commemorative event might be a dedication for the new memorial. 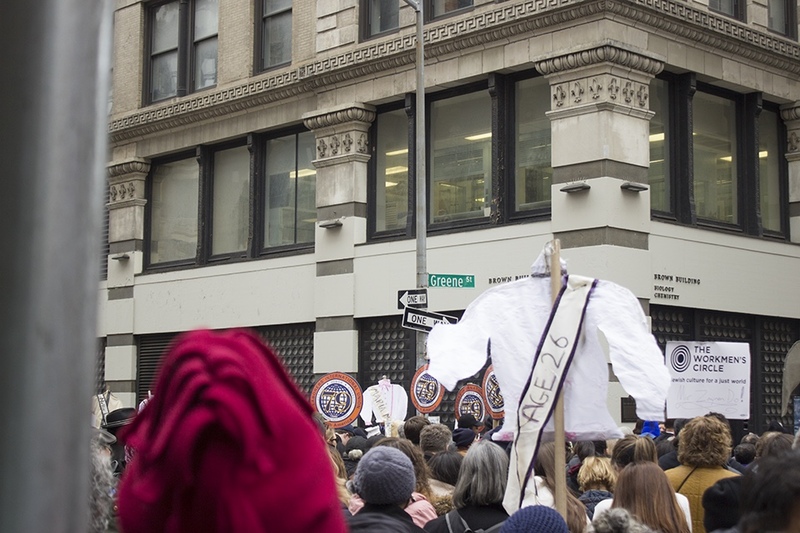 That means that instead of 8 chalk drawn silhouettes, there may be a list of 146 names permanently etched into the Triangle Shirtwaist Factory building by next year’s memorial.